Bruce Nauman deals with the big questions of life, in the words of his 1983 neon: Life, Death, Love, Hate, Pleasure, Pain. 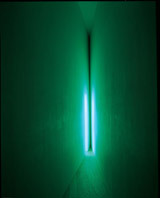 Nauman's work focuses on the essential elements of the human experience. Elusive Signs: Bruce Nauman Works with Light, premiering at the Milwaukee Art Museum January 28 – April 9, is Nauman's first solo exhibition in Wisconsin, the state in which he was raised. Bruce Nauman has been recognized since the early 1970s as one of America's most innovative and provocative contemporary artists. Bruce Nauman works in diverse media; this exhibition focuses solely on light. Light offered Nauman a medium that has the quality of being both elusive and effervescent while aggressively pervading an environment with its message. Nauman's art is motivated by ideas, not an attachment to a particular medium. Through the use of neon signs, a public and familiar means of communication to relate an idea, Nauman's goal is to make the viewer think. New York Times critic Michael Kimmelman noted, "he inspires reverence, or loathing…It's hard to feel indifferent to work like his." The exhibition is divided into three sections, split by two fluorescent light environments (a room and a corridor). The sections are: early neons based on identity, word game neons and figurative neons. There are approximately 15 works in the exhibition. The first section in the exhibition features Nauman's early neons on the subject of identity. Working in his first professional studio, the neon beer signs in the shop fronts of his San Francisco neighborhood intrigued Nauman, who became determined to subvert the commercial purpose of the advertisements. In response, the artist created Window or Wall Sign (1967) and hung it in the window of his storefront studio. With this piece he sought to achieve "an art that would kind of disappear – an art that was supposed to not quite look like art." 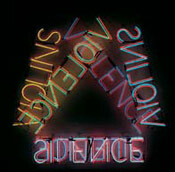 Nauman then embarked on a series of neons that grapple with questions of identity. Interested in the philosophy of Ludwig Wittgenstein and building upon his early performance works, the artist produced Neon Templates of the Left Half of My Body Taken at Ten-Inch Intervals (1966) as an innovative exercise in portraiture as sculpture. With My Name As Though It Were Written on the Surface of the Moon (1968) he forces the viewer to contemplate a signature as the object of art. Two fluorescent light environments divide the exhibition's three sections. The rooms force the viewer into tight or oblique spaces with harsh lighting effects that heighten the perception of space. The two works are the Helman Gallery Parallelogram (1971), a green fluorescent light room, and the Corridor with Mirror and White Lights (1971), through which the viewer must pass, providing spatial counterpoints to the neon signs. The exhibition is organized by the Milwaukee Art Museum's new chief curator Joseph D. Ketner II. The exhibition is sponsored by Carlene and Andy Ziegler. After its debut at the Milwaukee Art Museum, Elusive Signs travels to Indianapolis Museum of Art, Indiana (2006); Museum of Contemporary Art, N. Miami (2006); Henry Art Gallery, University of Washington (2007); Musee d'art contemporain de Montreal (2007); and the Museum of Contemporary Art San Diego (2008). 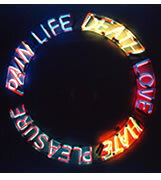 Bruce Nauman, Life, Death, Love, Hate, Pleasure, Pain, 1983. Collection Museum of Contemporary Art, Chicago, Gerald S. Elliott Collection.